This is typical Andy: desperate and clueless! In his latest attempt to discredit the felony fraud charges which he is currently awaiting trial for, Andy Esquivel has resorted to identity theft. Maybe Identity Theft is too strong a term since what Andy is doing is technically not “illegal”, only against the terms of service of LinkedIn, but I still think it’s interesting that Andy continues to use deception to plead the case that he is not a fraud. This week in an effort to prove that he did not in fact con his aunt out of $60,000 by encouraging her to invest in a scam website called “Xtagged,” Andy posted a fake LinkedIn profile which he claims is his aunts. The profile proclaims in typical Andy fashion that she was not a victim but an owner of Xtagged and that she will be testifying in court. 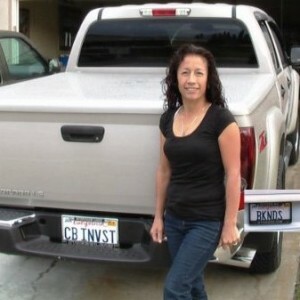 Her profile photo is Andy’s Aunt with the license plate of her vehicle (no normal person advertises their license plate, especially on LinkedIn) and actually includes an added plate on the right side that was added with a cheap photo editor like the ones Andy uses because he can’t afford Photoshop. 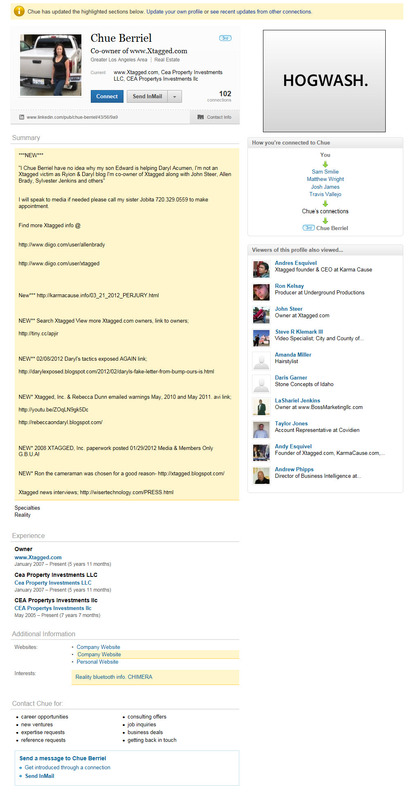 “www.Xtagged.com” (which has been offline for months) is listed as her FIRST occupation, and the other companies she owns are only listed secondarily – this in spite of the fact that per primary field of work is listed as “Real Estate” not “online scams”. In her “summary” section, there is a bright news post with the headline “***NEW***” just like in Andy’s various real and fake profiles. She (he) then follows with six more “*NEW*” pronouncements further down the page, as if she (he) is advertising soap. No normal professional puts news flashes in their summary like this. LinkedIn isn’t MySpace or Blogger, a fact Andy struggles to comprehend. The Summary newsflash begins with a statement in QUOTES, as if the person writing isn’t the person who actually made the statement being transcribed. If Andy’s aunt was typing this information in her own profile, she wouldn’t be quoting herself. The fake profile’s author refers to “Ryan &Daryl” as if she (he) knows us personally and as if they are under the assumption that anybody reading this profile will know us by first name as well. Since I’ve never met Andy’s aunt, this is strange behavior. The profile urges readers to call Andy Esquivel’s convicted felon, con-artist mother and gives her phone number. First of all, why would Andy’s aunt want professionals who view her profile on LinkedIn to contact her wacked-out, drug using, convicted felon sister who is out on parole and who’s a pariah in her family to get more information about her investments? Wouldn’t it make more sense for her to refer to her own contact information, which is already available to people connected to her through her professional profile? Finally Andy (posing as his Aunt) goes on to list a dozen or so links to his various blogs and postings on the web. This is odd behavior for a real-estate investor in California, but typical for a blog-whore like Andy. She (he) includes links to all of Andy’s favorite snippets, from Ron the cameraman being chosen for good reason to Rebecca Dunn’s “warnings” about this and that and blah, blah, blah that only Andy Esquivel thinks is interesting. We obviously have independent confirmation that this profile does not in fact belong to Andy Esquivel’s Aunt (as if we needed it) and I’m sure the administrators t LinkedIn will be getting a complaint soon and will take it down. Andy did the same thing with Rebecca Dunn: posting a fake profile of her and later pretending that the profile was created by the owners of this blog. I suspect that many of the other profiles that Andy promotes are also fake and created so that he can sock-puppet various people. It’s a common tactic of sociopaths and further evidence that Andy needs medication or detoxification or both. You know, I thought this would get old after a while…I was wrong.